If trolling is a tactic that you use while fishing out of a kayak have a look at Offshore Tackle's OR34 Mini Planar Board. It is reversible, and comes with everything you need to use on the water. It runs directly off of your line and is ideal for light tackle fishing. The Great Lakes Region has different laws regarding the number of rods you can use, depending what state or province you are in. In Ontario the limit is 2 rods for the Zone's Lakes that allow multiple rod trolling. In Michigan you are allowed 3 rods. Since I live near International waters, on Lake St. Clair and frequently fish in Michigan, I have learned to fish using 2 and 3 rods at a time. Learning how to keep your lines from tangling when you are battling a fish is important if you don't want to waist too much time getting your line back in the water after landing your catch. 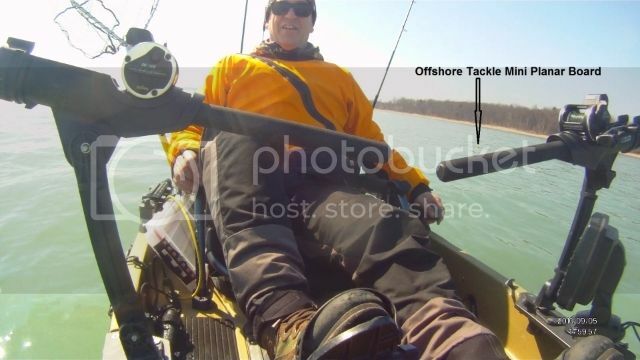 Now I should mention here that using a Hobie Mirage Drive Kayak with hands free fishing makes it a lot easier fighting fish and continuing your forward momentum by peddling your kayak. Though I have caught fish trolling 3 rods without lines crossing, in river current, and without using planar boards, I highly recommend learning how to use planar boards and especially with Offshore Tackle's OR34 Mini Planar Board which you will hardly notice any extra drag whether you are paddling or peddling. Being able to spread a line out from your kayak will only make your presentation that much more discreet and help to keep things from getting crossed when you do hook up to a fish. I use planar boards pretty regularly at Cumberland for stripers. Works quite well. If love to try some of the smaller planar boards like these.